PingUI is a small tool, a ping utility with interface, for the Windows Operation System, that give you the option to run a Ping command from a User Friendly Interface. The tool can be also use for continuous ping. PingUI is a small Wrapper for the ping command line tool. You can use it to ping a destination host to check if the host it up or down. 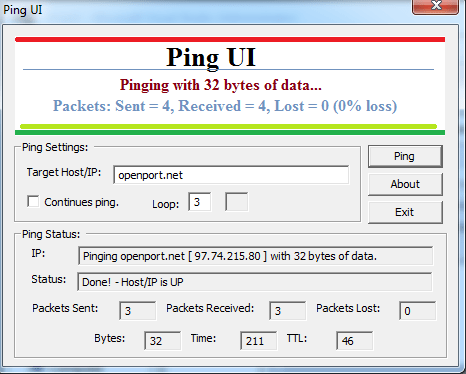 Loop – Enable you to set the number of ping package to send. Continuous ping – While mark, the ping will continue to run. A ping, as in ping pong is a special package that send from one device to another device, the package called ICMP (Internet Control Message Protocol) and by sending the ping package the other device replay with another package, the default information from the Ping Command is the state of the network and the remote device. if the remote device is up, it replay to ping and the time it take the ping command to reach the target device. Please also check our free open port tool.